Probably you have heard of GMOs and are at least somewhat concerned. Genetic modification (GM), more correctly genetic engineering (GE) of foods, actually has to do with splicing so as to artificially insert genes into the DNA of food plants and animals. Such genetically modified organisms (GMO) involve genes from bacteria, insects, animals, viruses, and would you believe, even from humans. The Creator taught Cain the strength of living soil is of first consideration to our health and wellness. After decades of farming with only a few synthetic (man-made) chemicals, America's depleted and dead soils no longer possess the living microbes to prepare organic nutrient complexes from Biblical fertilizer for easy plant uptake. Scientific studies are revealing alarming decreases in plant nutrient levels and resulting human nourishment in just the last twenty years. "This is crazy!" the reader of Eatin' After Eden said to his friend Ellen. Yet Larry couldn't put the riveting book down. 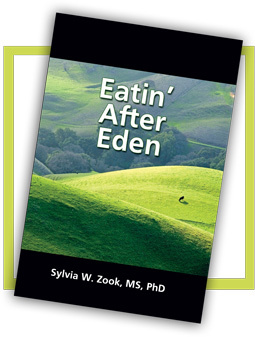 When he had complained about the diet his nutritionist had him on, Ellen had suggested Eatin' After Eden and gave Larry a copy. "It won't hurt you to read it," she said. For one who has never known anything but a conventional diet, the thought of eating red meat and saturated fat was mindboggling. When Larry again exclaimed, "It's just crazy!" Ellen responded enthusiastically, "It works!" and grinned. Why Do We Need Something Different, Something More? Yes, this book is different from the rest though some others also include the Good News; even teach a similar diet, and what’s wrong with the conventional and the Standard American Diets (S.A.D.). What’s wrong is they don’t work. When two medical doctors and two sports figures religiously following the conventional heart health diet drop dead from a heart attack (MI) within a short time, something’s is very wrong. Next we will consider the third largest diet group in America today, both world and Church. What You Are Not Eating Can Hurt You! 10 Reasons You Need Red Meat! 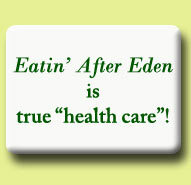 Grass-fed beef and lamb, moose, elk, oxen, and fatling calves1---information regarding these and all the following reasons for eating red meat, are included in Eatin' After Eden. In Chapter 3 readers will learn about the highest quality protein, and of the fascinating experience of Dr. Vilhjalmur Stefansson. Dr. Stefansson very successfully consumed nothing but organically grown raw beef for a year under the careful watch of the famous metabolic expert, Eugene DuBois at New York's Bellevue Hospital, where Dr. Stefansson lived during the study.